Now I'm at college, the high school 'no nail polish' rule finally doesn't apply to me anymore, so I wear nail polish all the time - it feels very strange when I have bare nails! 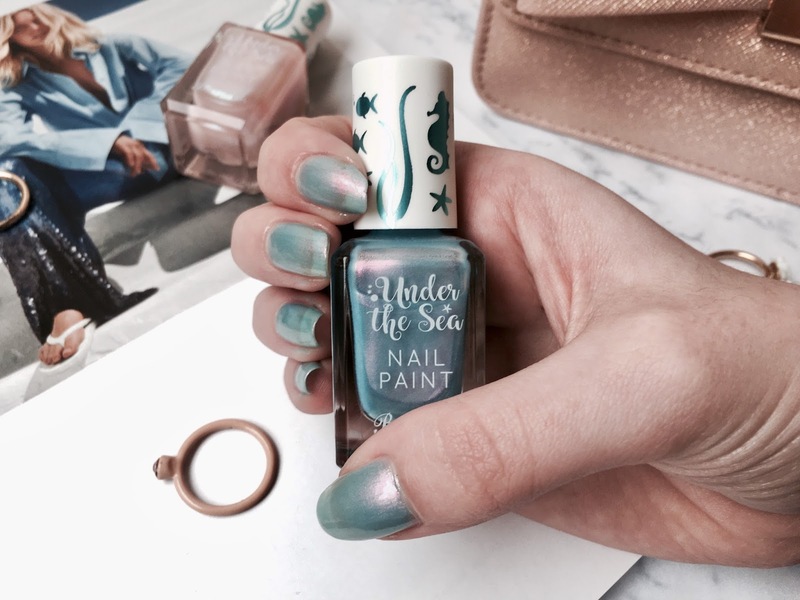 Therefore I'm always after a new nail polish to add to my ever-growing collection, and Barry M's new Under The Sea collection certainly caught my eye. I mean, a two-toned formula that looks so majestic as it seems to change colour in different lights, in a variety of shades? Yes, please! I picked up two of the four shades, so far anyway! The first being Angelfish, a light pink sheen that I have worn constantly for at least a month now, I just couldn't get enough of it! Then recently, while taking advantage of Superdrug's current 3 for 2 across all cosmetics offer, I picked up the blue shade, Butterflyfish. Believe it or not, before these nail polishes, I had never really tried Barry M's selection; crazy I know! So I was, of course, intrigued to see how their formula compares to other brands. At only £3.99 these nail polishes are easily affordable, especially for their unique shades, but I couldn't be sure how good the quality would be. I'm very glad to say they apply so easily - the brush with them makes it really easy to apply the polish precisely, while they do dry fairly fast so I don't have to wait forever for them to dry. I generally apply them in three coats, while also using a base coat and a top coat and that seems to do the job just fine. What I was most impressed by, however, was how long they lasted on my nails! I mentioned before I had the shade Angelfish on my nails consistently for over a month, and it's probably because I'm not having to apply it all the time. Most of my nail polishes, even the more expensive Essie shades, usually last a week before they have badly chipped off, but with the Barry M selection, they have lasted at least two before I need to reapply. I am so excited about this because I hardly ever have time to paint my nails, so they make it a lot easier! The shades themselves are absolutely gorgeous, obviously, the main thing that stood out to me, and they look just as pretty on the nails as they do in the bottle. I love how unique they are and the fact they do four shades in the formula means there's at least one to suit everyone. I would love to try the purple shade too, but I have never found it in my local Superdrug, and the fourth shade is a bright pink which can be a bit bright, especially with its yellow undertones. I love the idea of two-toned polish, the lighter shade Angelfish is mostly light pink with a light blue tone, while Butterflyfish is a blue with a bit of pink in it. They're honestly so gorgeous and I love how shimmery they are too! 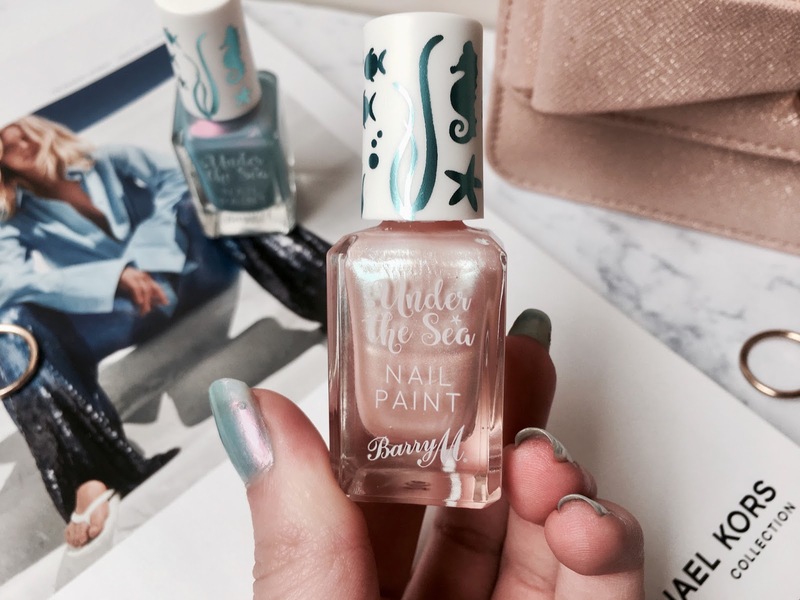 Have you tried Barry M's nail polishes before - I would love some more shade suggestions to try! That's such a beautiful colour! I didn't even know that this was a new range from Barry M, so pretty! !